Fatayer Jebneh or cheese pastries are popular pastries sold in the Middle Eastern countries. They are called pastries or pies but unlike the western world pies which are made with flour and fat, these are made with a yeast dough. These pastries are popular street food served in Egypt, Lebanon and Middle East countries. The origin of these pastries is unknown as each country claims it as their own. The yeast dough has yogurt and baking powder added to it to make it soft. 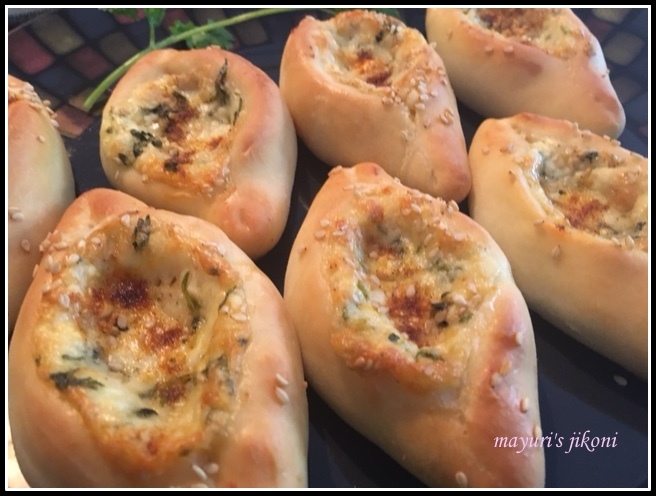 The filling for fatayer can be cheese (Jebneh), meat or spinach. The shape too varies. They can be cigar shaped, round, triangle or boat shaped. The cheese fatayers are usually filled with akkawi, a salty, chewy cheese that originates from Palestine mixed with a little bit of cheddar and kashkaval cheese. However if these cheeses are not available one can combine feta, mozzarella or ricotta with some cheddar cheese. Spices usually that are used to flavour the filling are nigella seeds or zaatar or a combination of cayenne and paprika powder. Herbs used are usually coriander, flat parsley or mint. I had this recipe bookmarked ever since I came across it on Saswan’s blog ‘Chef in Disguise’. Dinner guests and Sue of Palatable Pastime‘s suggestion to use any kind of peppers—fresh, dried, ground, sweet or hot, the three just fell into the slot perfectly. One more bookmarked recipe done, followed Sue’s suggested theme for August and happy guests. What more can I ask for. Sue thank you for an interesting theme. Must admit when I read peppers for the Bread Bakers’ theme, the Indian in me was calling out for a hot hot hot bread… not temperature wise but taste wise. However, had to hold back and just put a wee bit as kids too were my dinner guests. I used a combination of feta (as we don’t get akkawi), mozzarella and cheddar cheese. I added both fresh coriander and mint to the filling and sprinkled a combination of cayenne and paprika powders along with some sesame seeds. Mix flour, salt, baking powder, sugar and yeast in a big bowl. Add olive oil and rub into the flour. Mix water and yogurt. Use the mixture to form a dough. Knead the dough till it becomes smooth and doesn’t stick to your hands. Grease the bowl and dough with oil and cover it with a tea towel or cling film. Let the dough rise till double in size. Crumble or grate the feta cheese. Grate mozzarella and cheddar cheese. Mix paprika and cayenne powders. Add coriander, mint and a bit of the mixed pepper powder to the cheese. Divide the dough into 20 parts. Roll each part into a ball. Using a bit of extra flour roll one part into a 8cm X 10cm oval. Put a tablespoonful of the filling in the middle. Fold one edge of partially over the filling. Fold the other part but not covering the filling. The ends of both folds should overlap. Press the ends.It should look like a boat. Repeat steps 2-6 with the remaining dough balls. Place the fatayer on a greased or lined baking tray. Let the dough rise for 20-25 minutes. Brush the tops of the fatayer with milk or olive oil. Sprinkle sesame seeds over the dough part. Bake the fatayers for 15-20 minutes or till they are light golden in colour. Remove the fatayers from the oven and cool them on the wire rack. Sprinkle the remaining paprika cayenne powder mixture over the cheese part while still hot. Enjoy them with mint tea, coffee or some soup. Adding yogurt and baking powder makes the dough more soft and pliable. Shape them into triangles, round or cigar shapes. Use zaatar instead of the coriander and mint. Can use dried coriander and mint. Add the pepper powders according to your taste. I used half quantity in the filling and half to sprinkle over. My cayenne pepper was not too hot. What I love most about Bread Bakers is discovering new kinds of bread like this. How fantastic! I love learning about dishes from other cultures. Thanks for posting this fabulous recipe. Great tutorial on how to make this beautiful bread! Those little “boats” look wonderful. Thanks too for the lesson on this bread! I love exploring new bread. This is a new recipe for me and I loved it. It has indian flavours and with lovely stuffing I can imagine the flavours and deliciousness. This is bookmarked for sure! The bread looks super delicious Mayuri. I have never tried anything like this before! The stuffing sounds delicious Mayuri . Lovely cute shaped breads….. These would be great for a brunch spread! Enjoyed this bread so much. What a flavorful and lovely fatayer you got there Mayuri. Awesome pick for the theme.